Early morning last week…a drone took off over Hambledon after light snow. Perfect conditions, the snowflakes had settled into the valleys of the great encircling hillfort ditches… and streets of round house platforms became visible as rows of hollows outlined in white. Hambledon Hill light snow shows the dimples where Iron Age round houses once stood. 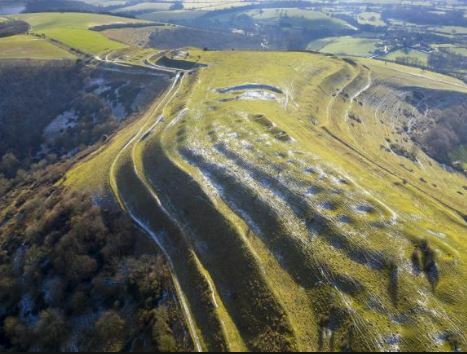 These photos help illustrate the majesty and awe of this vast archaeological site and has helped us launch the National Trust’s Wessex Hillforts and Habitats project. With the help of Marie, our project officer, the People’s Postcode Lottery have granted over 100,000 pounds to get the project started. 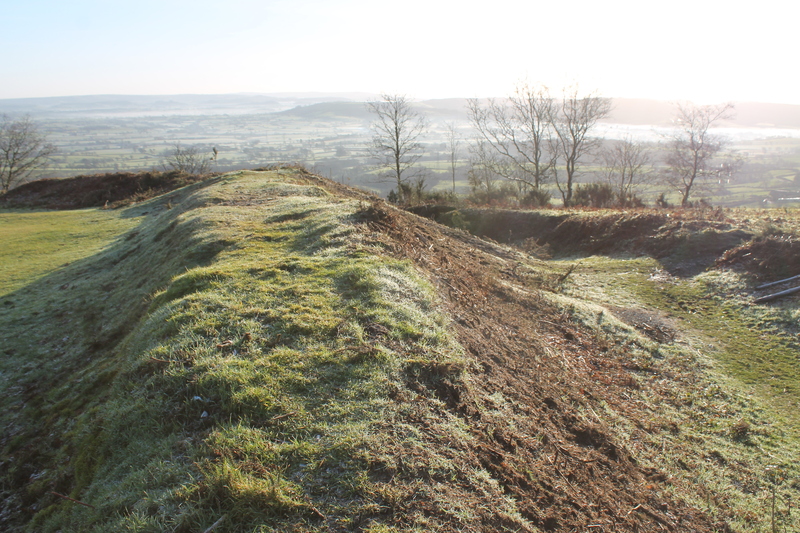 The primary purpose of the project is to enhance the conservation of 13 NT Iron Age hillforts scattered across Dorset and South Wiltshire …but it will also inspire people to get involved and to carry out monitoring and research. 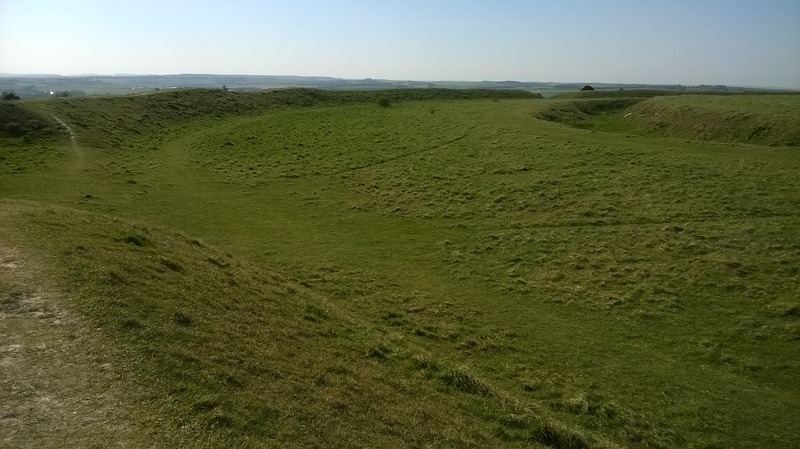 It will also create new interpretation to bring these grassy hill top earthworks to life as places to be appreciated, valued and better understood. Alongside this.. to highlight nature, particularly the plant and insect life. Each hillfort’s unique topography nurtures precious habitat undisturbed by agriculture for over 2000 years. So.. where are these places. I’ll list them out for you…. and as some have featured in previous blog posts I’ll reference these while we have a quick tour. We’ll start in Wiltshire and from there head south and west and eventually end at the Devon border. 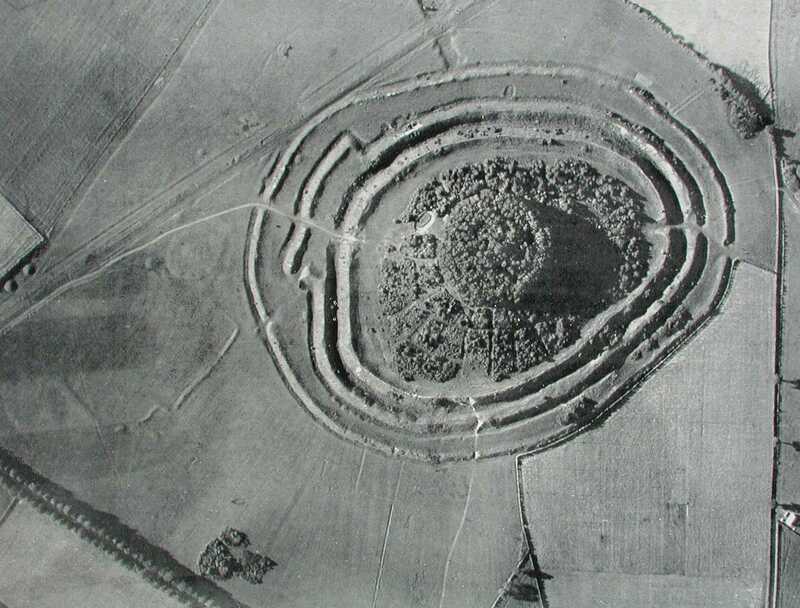 Figsbury Ring, north-east of Salisbury. A circular rampart and ditch with a view back to the great cathedral spire. Strangely, Figsbury has a wide deep ditch within the hillfort ..potentially Neolithic but there is no rampart.. where did all the chalk go? Figsbury Ring from its rampart top showing the wide deep ditch inside the hillfort. South of Salisbury, Wick Ball Camp above Philipps House, Dinton.. NT only owns the outer rampart. Then there is the icon of Warminster, Cley Hill (blog posts “Upon Cley Hill’; Upon Cley Hill 2”), a flying saucer shaped chalk outlier with two round barrows on the summit..a strange hillfort. To the south west, at the source of the mighty River Stour, is the Stourhead Estate with its two hillforts. These are Park Hill Camp, its views hidden by conifer plantation and Whitesheet Hill (blog Whitesheet Hill Open at the Close) with wide prospects across the Blackmore Vale towards Hambledon and Hod. We’ll follow the Stour to reach them. Now from Badbury take the Roman road west to Dorchester and keep going beyond the county town, glancing at Maiden Castle as you pass(Duchy of Cornwall, English Heritage). The Roman road continues straight towards Bridport but branches from the A35 road before you reach the village of Winterbourne Abbas. It has now become a minor road.. a couple of miles on… it branches again..still straight but this once arterial Roman route to Exeter has dwindled to a narrow trackway with grass sprouting from the tarmac. Don’t lose heart…keep going…and you will break out onto the chalkland edge and the multiple ramparts of Eggardon Hill. From Eggardon, the other hillforts emerge as sentinals ringing the high ground overlooking the Marshwood Vale, and, to the south, the cliffs of Golden Cap.. and beyond, the sweep of Lyme Bay and the English Channel. Next to the west is Lewesdon Hill, a small fort but occupying the highest land in Dorset, nearby is the second highest, the flat top of Pilsdon Pen, surrounded by double ramparts and enclosing Iron Age round houses, Bronze Age round barrows and the pillow mounds of the medieval rabbit warren. The last two in the Project guard a gap through the Upper Greensand ridge at the Devon border. Coney’s Castle has a minor road running through it and on its south side are wonderful twisted moss covered oaks… and beneath them the deep blue of bluebells in the Spring. Lambert’s Castle was used as a fair up to the mid 20th century, remains of the fair house and animal pens can be seen there ….but once again the views are spectacular, particularly in early morning after frost with the mist rising from the lowland. Lambert’ s Castle after frost. A baker’s dozen of hillforts of the 59 the NT looks after in the South West. If not, these nationally important scheduled monuments and SSSIs will deteriorate. The earthworks will become overgrown and grassland habitat will be lost, archaeological knowledge locked in the layers beneath the soil will become disrupted… and the views into the landscape and across and within the hillforts will become hidden. 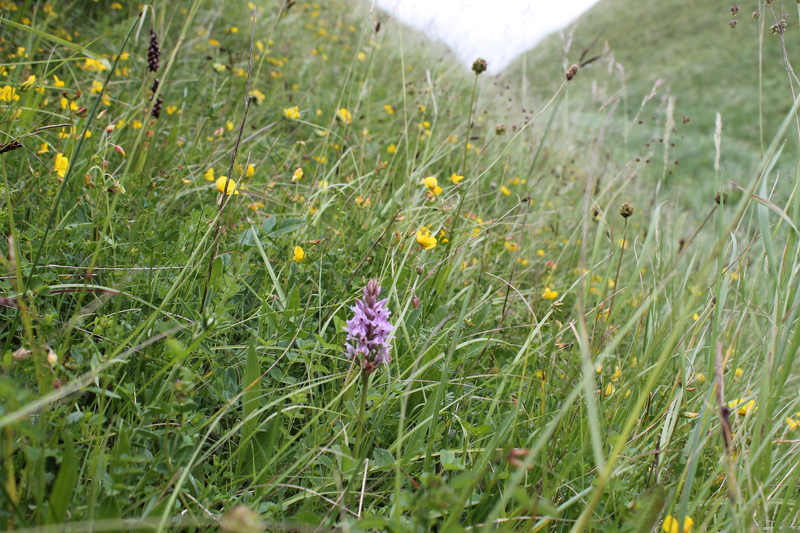 The Wessex Hillforts and Habitats Project promises to be an exciting time of conservation and discovery. The work has now begun! Look into this photo…look deep into this photo. Yes, I know.. it’s just a bit of farmland. Look deeper…there’s at least 4000 years of farmland here. Look at the hedgerows….they’re very precious …on a European scale, our bushy boundaries are surprisingly rare and wonderful for wildlife. Off to the left is the edge of Badbury Rings.. so we’re on the Kingston Lacy Estate in Dorset again. Kingston Lacy for me is like Miss Marple’s village. We are on the south side of the grand Beech Avenue. William John Bankes had this planted for his mother in 1835. This land has been ploughed for many generations. Bottom centre, there’s a dark circle with a black blob in it. The ploughing has levelled an Early Bronze Age burial mound and all that is left is the cut of the quarry ditch. From here the chalk was dug to heap up the bright white mound over the grave. Perhaps the body is still in the grave pit marked by the blob. The Round Barrow was once an eye-catcher. About 1000BC the land was divided into units by linear boundary ditches. Perhaps population was rising. Boundaries needed to be clear and well defined. The barrow mound formed a good fixed point and the boundary runs against it. Look again. This linear boundary does not follow a straight line. It has to weave between existing fields. Can you see the white ghost lines of the chalk field banks it has to negotiate. These are small ‘celtic’ fields, in use from the Bronze Age through to the Roman period and later. Many hedge and wall field systems in the west still follow boundaries as old as this. Look up to the centre right and see a group of dark-lined enclosure ditches overlying the ghosts. I walked there with the farmer once and recovered scraps of Roman pottery from the new ploughed field. Stock enclosures, Roman development over part of the old system. Zoom out a little… can you see broad bands of darker and lighter stripes running roughly with the hedgerows?.. These are the remains of the furlongs and strips of Shapwick’s common arable field system. A time of centralisation when scattered farmsteads and fields became concentrated. 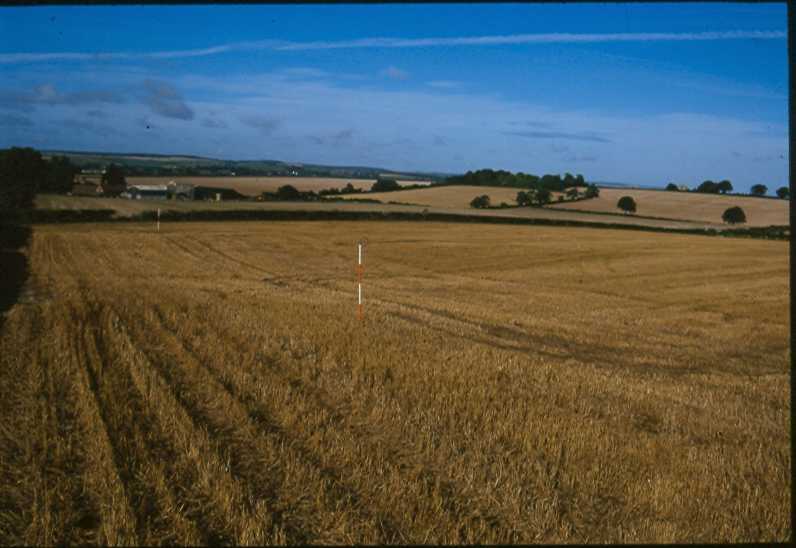 Devised by the Saxons, around the 10th century, communities farmed their scattered strips within the great fields, managed by the lord’s manorial court. At Kingston Lacy, this system continued right down to the 19th century. We have a great map showing all the strip fields in 1773-4, it tells us who farmed what.The small guys were being squeezed out by the larger farmers. How old fashioned! This was the advice of William Woodward, the surveyor, who advised the Bankes family to enclose the land. In 1813, a new map was made and the land was divided up into large economic farms with straight hedge boundaries. The smallholders became farm labourers. Look into this photograph. Look deep into this photograph. We are east of Badbury now. Towards Kingston Lacy Park. Bottom left is the tree-edged enclosure of Lodge Farm. All the names in the landscape matter. It’s ‘lodge’ after the medieval hunting lodge. The stone lodge itself now has a lawn in front of it. A 15th century building on the site of an earlier building at the gateway to the royal deer park and warren of Badbury. This park is documented right back to Henry de Lacy’s time in the 13th century. 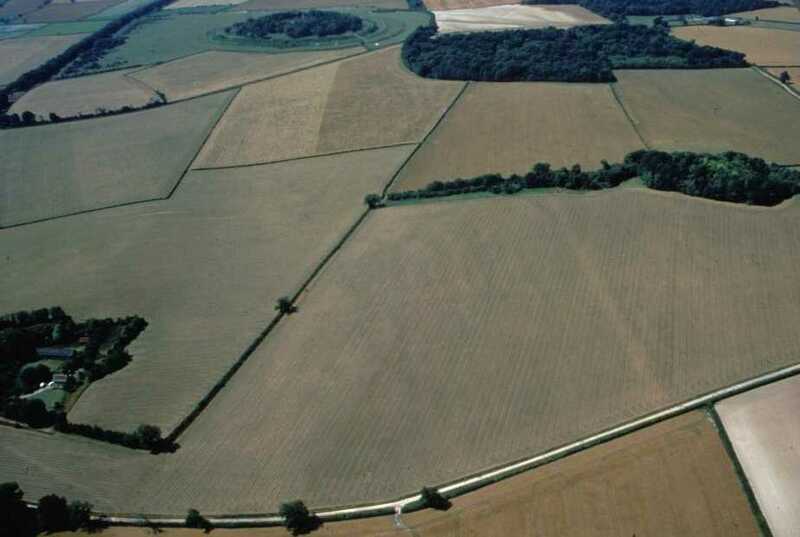 Top, right of Badbury, is the medieval High Wood, and middle right is a hedgerow strip marking the deep survival of the broad medieval deer park ditch. Designed for fallow deer to leap in but not get out. Deer were valued for their high status meat, a preserve of the rich carefully nurtured and guarded. Badbury Warren was maintained right up to bachelor John Bankes’ day. There were complaints that the thousands of rabbits kept there, got out into the corn and coppices and damaged the crops. John’s mum Margaret always kept the accounts and when John took over the Estate he followed her example….right up to 1740, when he closed the account book and left a few sheets of paper there. One of these contained the inked in costs of enclosing the Warren. All the hedges in this photo were planted at this time. Their names give away the old use of this new farmland…’Lodge Field’, ‘Deer Hill Field’, ‘Hare Run Field’ and ..
Sometimes… in the right conditions…. 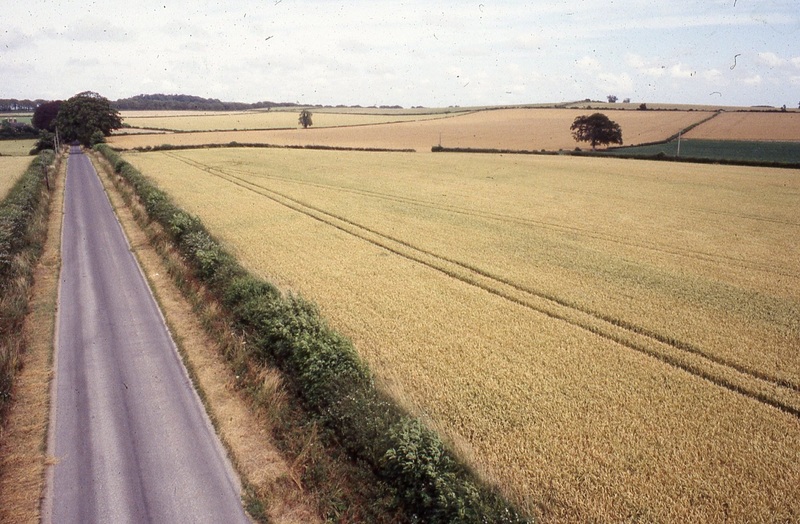 the Roman road from Poole on the coast to Badbury can be seen running from Lodge Farm across the fields.. aiming for the saddle of land between the hills of Badbury and High Wood. Not in this photograph though..
Look into this photograph…north of Badbury now…what can you see? The spaghetti junction of Roman Dorset! We’re looking down the barrel of the late 4th century road from Old Sarum (Salisbury), the London Road, to the civitas captital of Dorchester (still Dorset’s county town). This late road crosses two, perhaps three earlier roads. The Poole road turns in the middle left of the photo and splits. First joining the field boundary running to bottom centre (the road to London). Second crossing the centre of the field, under the Dorchester road, and continuing to Bath and…. Third.. following the straight, thick hedge boundary between Badbury and the arable fields. 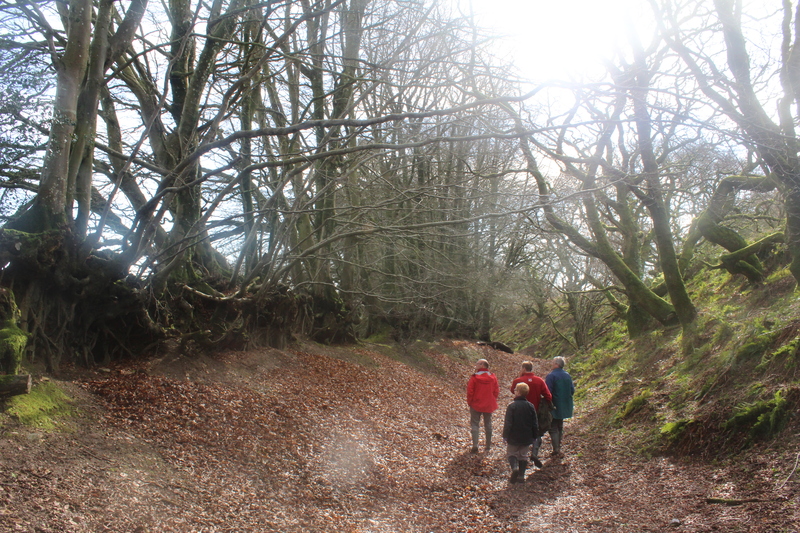 Another road, long forgotten, heading for the Somerset Roman town of Ilchester. and today it remains the parish boundary between the St Batholomew’s Church of Shapwick and St Stephen’s of Pamphill. 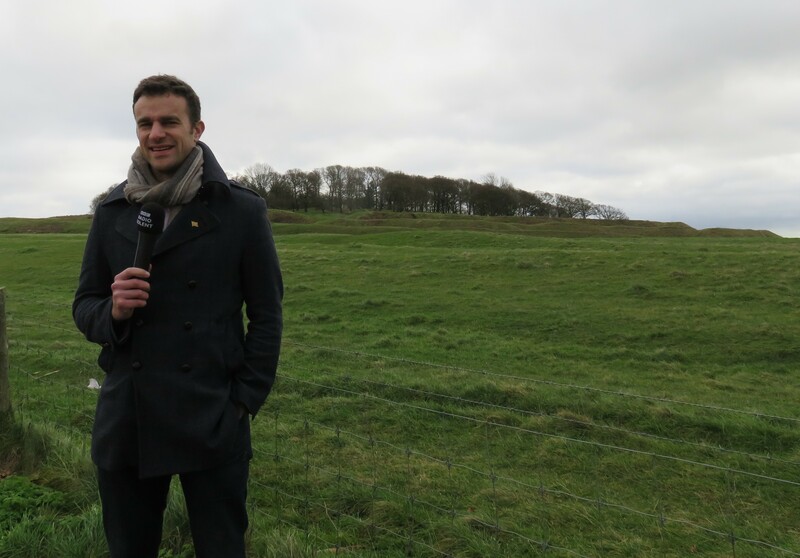 Yesterday I met Radio Solent’s Steve Harris in the car park at Badbury Ring, on the Kingston Lacy estate, near Wimbourne, one of Dorset’s many Iron Age hill forts. We headed towards the large banks and ditches of the fort as the nippy wind blew across the fields to cool our faces. As we walked across the Roman road and stopped to look at the Bronze Age burial mounds a Skylark rose into the air singing its soaring song. Steve wanted to talk about the hill fort for one of his regular features on his show. He hadn’t visited the hill fort for a very long time so this was my que to show off all the wonderful archaeology under our feet. There are almost too many stories to tell, across the thousands of years of human activity in the area. Apart from the obvious ‘humps and bumps’ of the Bronze Age barrows, Iron Age hill fort and Roman road, we have found evidence of the earlier use of the high ground the hill fort is on. When we excavated on he very top of the interior of the hill fort we found flint tools from both Mesolithic and Neolithic times. As Steve and I reached the summit of the hill we found evidence of a more modern use of the site, large concrete blocks with iron loops in the top. These were the remnants of fixings for a timber beacon tower which emitted a signal to guide planes back to Tarrant Rushton airfield a few fields to the west during WWII. Next to one of these blocks we finished the interview and looked out across the landscape, cars traveling along the road between the avenue of Beech trees, people walking their dogs, children running along the banks, birds chattering and the memories of our excavations came flooding back to me. Was it really 12 years since we were here, finding a clay sling shot, part of a small twisted iron torc, and beautiful worked flint tools. I will return when the many and varied wild flowers are in bloom, so long Badbury, till we meet again. This is the view along the Shapwick Road across our field towards Badbury Rings. Let’s walk across a Dorset field. It’s a good one.. and although we’ll stay in the same space we will be hopping about in time a bit. Well- we’re archaeologists after all. For the moment it’s late summer, the corn’s been cut and as we leave the far hedge and walk diagonally towards the road our boots crunch on the stubble. Keep your eyes down, there are all sorts of things beneath our feet. Yes. There. See it ? Sticking out of that tractor rut a black chunk of pottery. Pick it up. On the upper edge it’s polished but on the rougher zone below you have that typical cross-hatch pattern. Iron Age? Roman? I call this the ‘Long Field’. Not its old name.. but definitely very large and long. You’d notice that if you divided it up and surveyed it. There’s Geoff, laying out the grid, walking up and down with the magnetometer. He was the first man to map the archaeology here. I walked with him some days fixing the pegs, positioning the lines. We walked miles.. but the results were spectacular. Thanks Geoff. The field is bottom left. 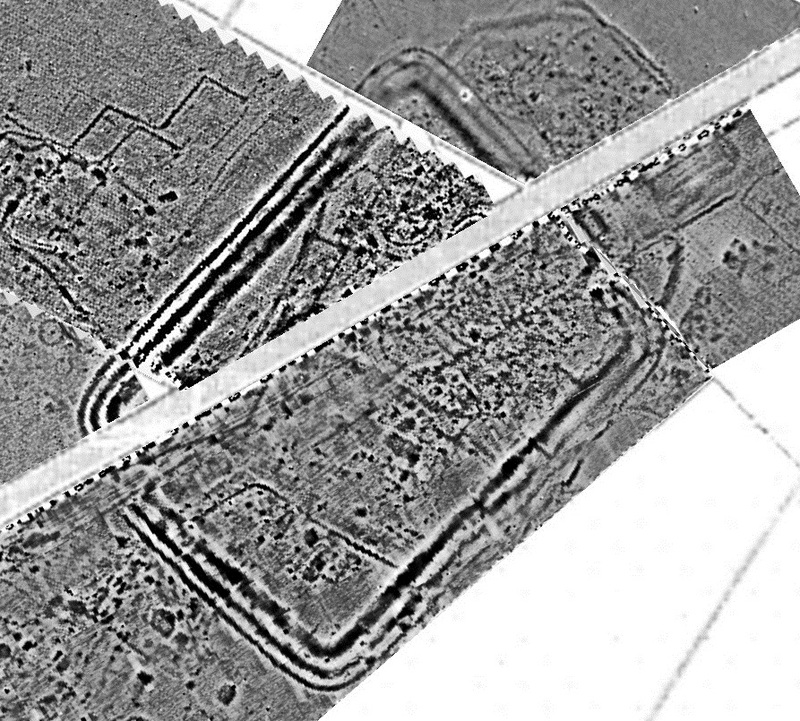 This is Geoff’s magnetometer survey showing the fort in detail and the underlying Iron Age settlement. If you look carefully you can see the parallel side ditches of the Badbury to Dorchester Roman road. Our walk is from fort entrance to fort entrance. From middle right to bottom left. You almost missed that. An orange samian base fragment. It has that silk sheen to it. Unlucky, the potter’s stamp is fractured at the edge and we can’t quite read who made it. Came all the way from Gaul though. We’re approaching a large’L’-shaped trench. Ian’s in a ‘bee-hive pit, narrow at the neck and twice the width at the bottom. It’s cool down there. He hands up something like samian except it’s ruby-coloured. An earlier pottery.. dates this grain storage pit to the Late Iron Age- 2000 years ago. someone’s placing a dog in the pit on top of a piglet. The field’s disappeared.. there are circular houses all around us, a hub-bub of people livestock and wooden fences within a settlement stockade. Gone again.. the place is blacksmith’s workshop, furnaces and hearths. These guys look Roman.. at least the pots are 3rd century style. From scaffold tower to scaffold tower. Looking towards the trench to locate the SW entrance of the fort. We’re in the field heading to another larger longer trench with a scaffold tower beside it. This is the main highway, the Roman road from Badbury to Dorchester but we are also in the middle of a large Roman fort. 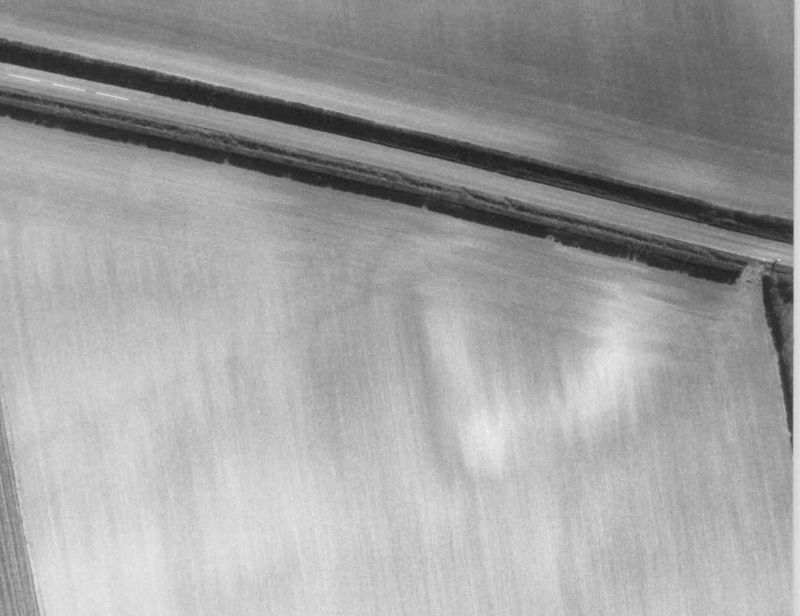 It was first seen on aerial photos in 1976, three concentric ditches with rounded corners. The first idea was that it was 1st century.. built on top of the Iron Age settlement right after the Roman Conquest of AD 43-44. Very different to the Roman fort at Hod Hill a few miles away though. It has only two entrances, one in the NE corner and one in the SW… and the ditches at the corners don’t quite match. Let’s climb the scaffold tower and look down at the trench. We’ve put it at the SW entrance. We can see the three ends of the ditches in plan. The road metalling has sunk into the soft ditch filling so it has not been ploughed away. The fort SW entrance from the scaffold tower. The outer ditch terminal is clear with remains of road metalling crushed into its surface. 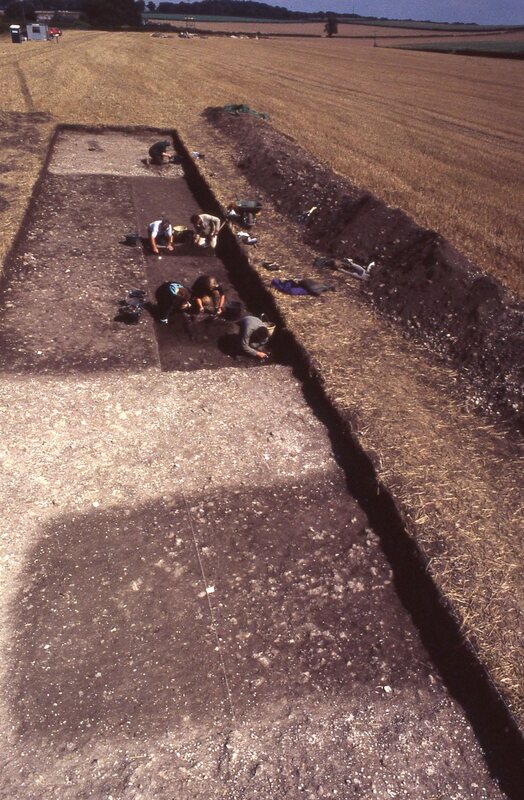 The middle and deep inner ditch have not yet been excavated. Most of the upper layers including the road have been ploughed away over hundreds of years. This land was part of the Shapwick common fields in the medieval period. 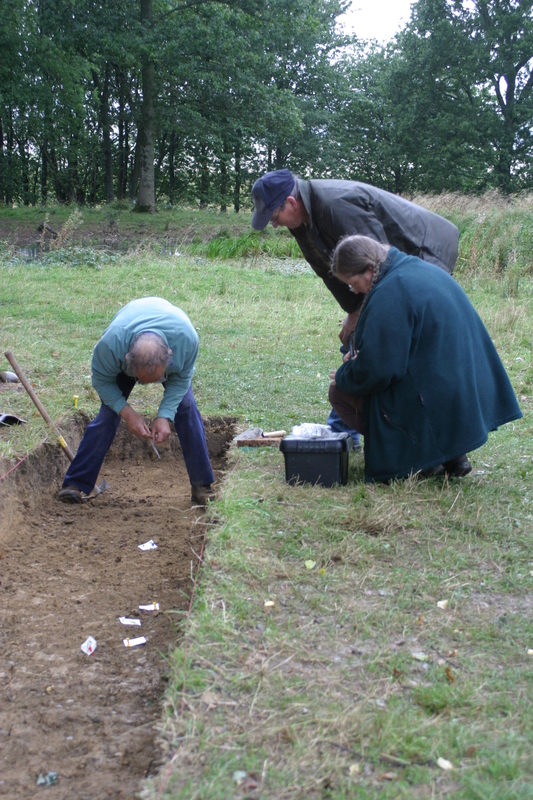 Gerald, Becki and Rob, if you could just remove the upper layers..yes, there are the ditches filled with pottery, animal bone and the occasional coin. It seems to date mostly to the end of the 2nd century. The outer two ditches are only a metre deep but the inner one is massive.. over 4m deep. Strange, some of the finds are 4th century. Here it is..white chalk ramparts with a timber wall along the crest of the innermost defence. Inside it is full of rectangular buildings. Curious, the Dorchester road is blocked by the fort gates guarded by soldiers. They’re checking all the traffic. The Saxon raids along the coast have increased in recent months and this place, Vindocladia, is vulnerable. They haven’t the resources to build stone walls like those at Durnovaria (Dorchester). This secure place, the burgus fort, will have to do the job. A place of last resort for the Romanised Brits. Tense times. Lets climb down from the scaffold and get into the car. I hope you enjoyed my favourite field. Nancy climbs in beside us. “How was it for you”…. “The earth moved”.. it certainly did.. and there was so much in it! Old John Bankes died back in 1772 and as he wasn’t married his younger brother Henry inherited. Henry only lived another 4 years but he did something remarkable. He commissioned a cutting edge surveyor called William Woodward to make a detailed record of his Kingston Lacy and Corfe Castle Estates in Dorset. This week Francesca kindly digitally photographed the whole survey. Yesterday, I sat in the conference room in Warminster and saw a remarkable aerial and lidar survey of Brownsea Island. The surveyor did whizzy things on the computer and zoomed into and enhanced images, measuring any detail on command. Things have come a long way since the 18th century but Woodward’s surveys are still accurate and detailed and also works of art. 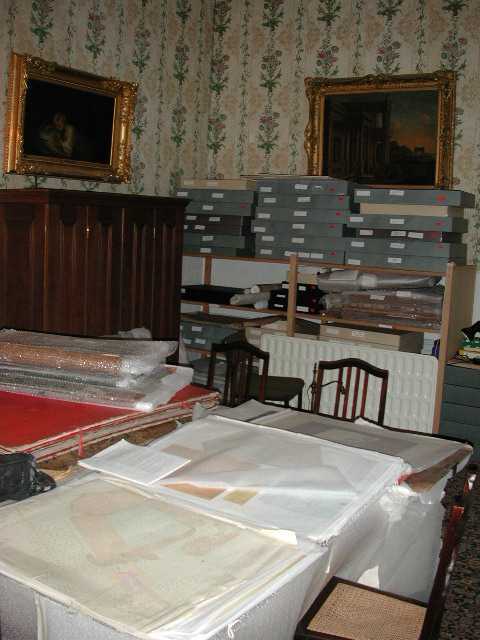 One can imagine Mr Woodward arriving at Kingston Lacy House in 1775 and being shown into the library to meet his important client, Henry Bankes, surrounded by the portraits of his ancestors. The surveyor would have placed the books on the desk and explained the conclusions of his work. The money that could be made by enclosing the common arable fields and creating compact farming units…. This is Woodward’s fold-out front map which shows all the land of the Kingston Lacy Estate each lettered compartment has a detailed map within the leather bound survey book. And there the books stayed through generations of the Bankes family gathering dust in the archive cupboard until 1982 when the Bankes family estates were given to the National Trust. I was given the job of creating a very different survey. To audit with management recommendations all the archaeological sites I could find on NTs newly acquired Kingston Lacy Estate. 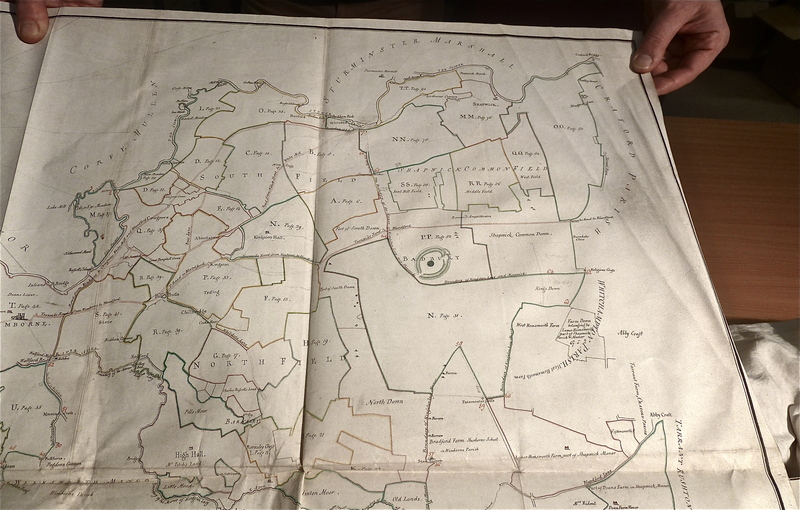 Woodward’s survey was the oldest detailed map of the land so I went to its new home in the Dorset Records Office in Dorchester.. to take a look. Wow! Historic maps are wonderful. 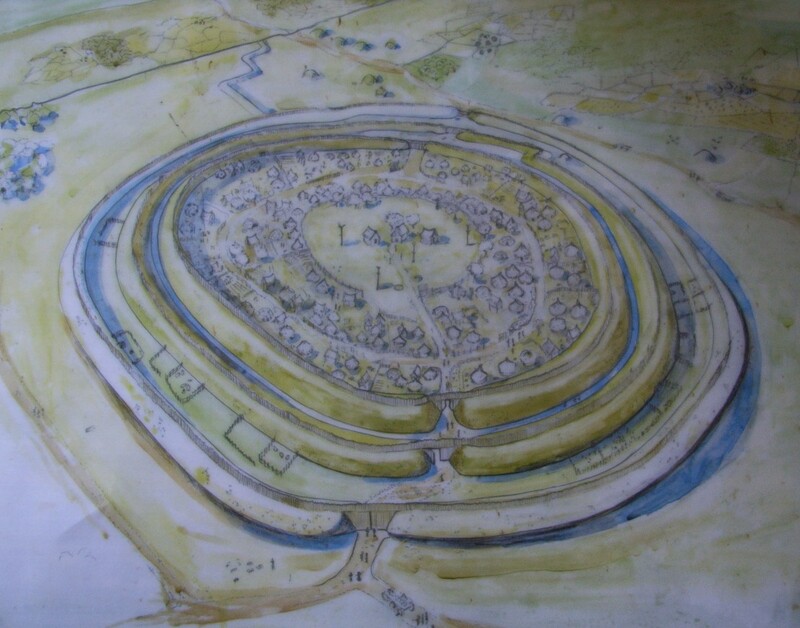 There was so much information…There was Badbury Rings hillfort… there were the three barrows clearly visible as they are today beside the entrance track… and there was the Roman Amphitheatre..Roman Amphitheatre? A detail of the front map. 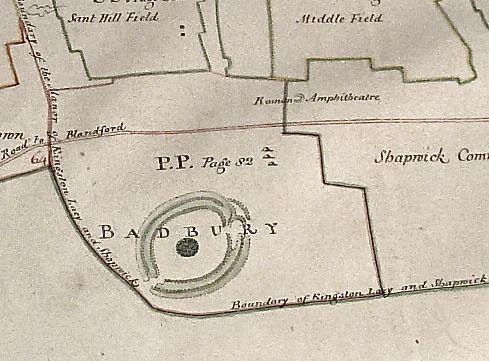 Badbury Rings hillfort.. three mounds which are Bronze Age barrows… Roman Amphitheatre!!? What was William thinking of? Things ‘classical’, Roman and Greek, were very fashionable in his day. What had he seen to make such a mistake? The only known amphitheare in Dorset is in Dorchester, the local administrative centre then as it still is today… I had to go and have a look on the ground. The ‘amphitheatre’ when I first saw it under stubble. The ranging poles stand on opposite sides of the 60m diameter enclosure which has a hollowed area at the centre. I peered over the gate into a wheat field, there was certainly an earthwork. 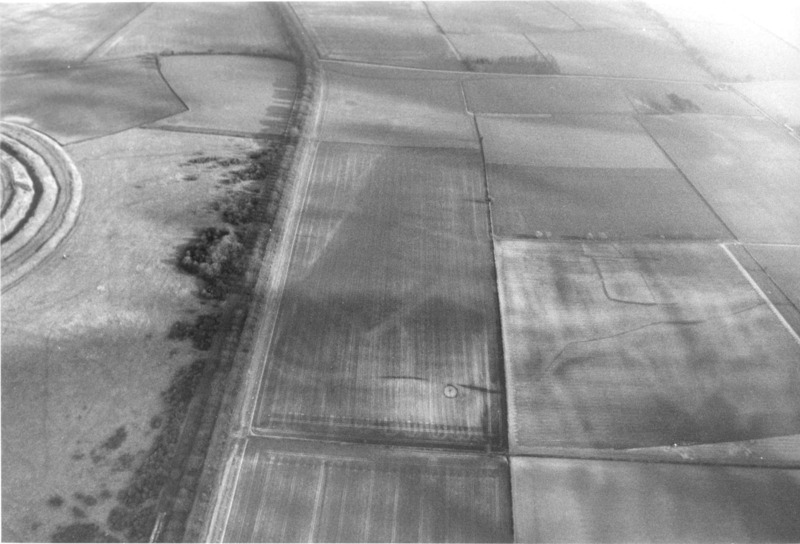 A ploughed down circular enclosure with a dip in the middle about 60m across. I asked the farmer and he said he thought it had been caused by a German bomb in WWII. That didn’t work, Woodward had seen it before it was ploughed over 230 years ago, it must have been an impressive earthwork then. 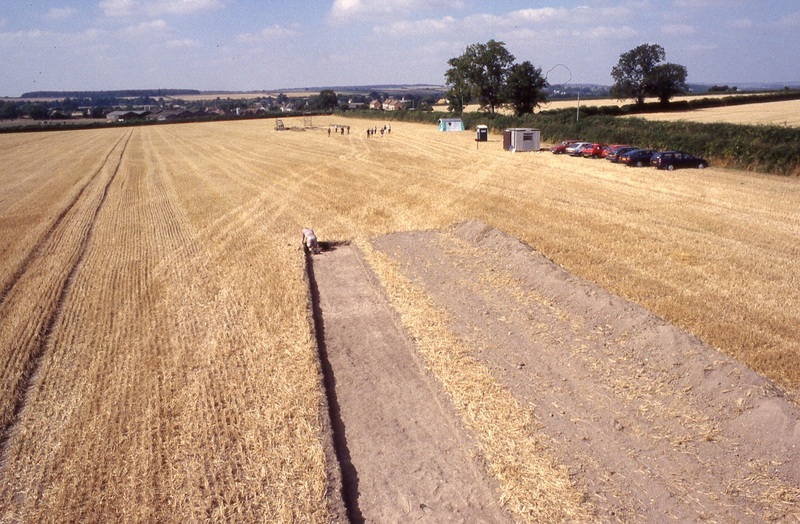 A photo of the ‘amphitheatre’ taken from a model airplane after ploughing. The white mark is the chalk bank and the darker line the outer ditch. An earlier field boundary ditch emerges from below the chalk bank at the bottom of the picture. David the warden asked a volunteer to send up a camera mounted on a model plane so that it could take aerial photographs after ploughing. 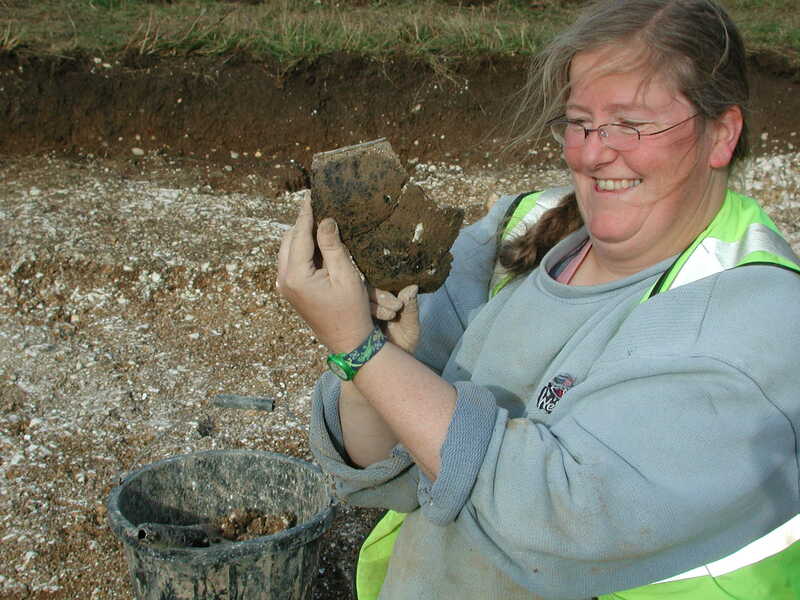 Later, we walked across the site picking up prehistoric flint and the odd piece of Roman pot. The whole thing looked promising. This was a rare puzzle.. so Tim the managing agent and the farmer gave us permission to put in two trenches where the enclosure bank was crossed by the hedge. We laid out a trench on either side of the ploughed down earthwork against the hedge beside the road down to Shapwick. Badbury lies beyond the Beech Avenue trees at the top of the picture. The ranging rod lies beside the outer ditch where a Roman spiral ring and a 3rd century coin were found in its filling. We found that a ditch had been dug and the chalk bedrock had been heaped up to form a once massive circular enclosure bank. Over the following centuries the ditch had gradually silted up. In the filling we found a lump of Roman roof tile, then a spiral bronze ring and a 3rd century Roman coin. Perhaps it was an amphitheatre after all. Then we realised that there had been an inner ditch but it had been backfilled almost immediately. Within the chalky fill were lumps of bone and thick black pottery. We were surprised when our trowels touched bone, then a whole skeleton was carefully uncovered at the bottom of the ditch. It turned out to be the the well preserved remains of a young pregnant cow. This was not the only animal burial we found, we also uncovered two sheep buried in pits within the enclosure (just in our narrow trenches..were there lots of burials hidden across he site?). We waited for the Radiocarbon dates to come back. When they arrived they dated the site to long before the Roman period. The animals had been buried in the period 1100-900 BC, the time when King David and later King Solomon ruled Israel. 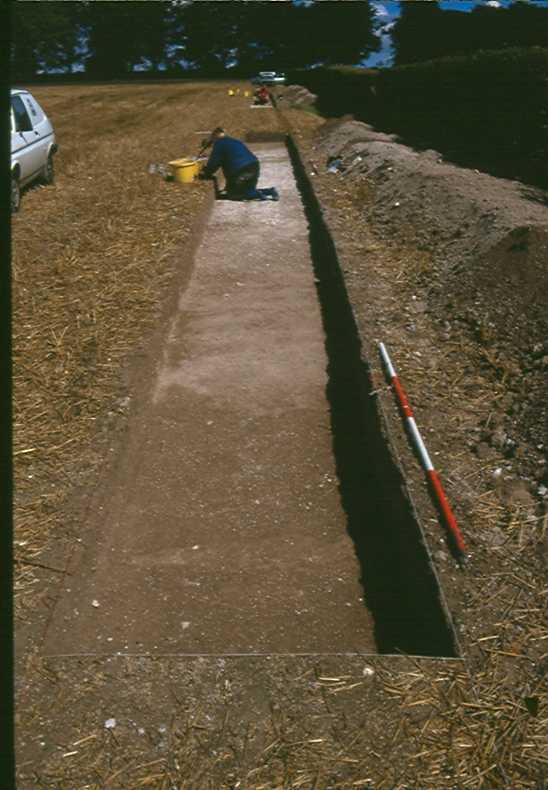 The outer ditch had silted gradually of the centuries but the inner ditch had been dug out and backfilled soon afterwards leaving the body of a young pregnant cow in the bottom. Over 1500 years ago, did the local Romano-British community regularly gather here to watch fights, contests and entertainments? If this was an amphitheatre it was like Maumbury Rings, Dorchester and had been adapted from an earlier earthwork. The Kingston Lacy amphitheatre started life as a Late Bronze Age sacred site complete with valuable livestock offered as sacrifices to whatever gods were worshipped at the time. An important site. The farmer kindly agreed to conserve it and took this area out of the plough. It has remained a small pasture field ever since. The earthwork is clear to see now, covered in grass rather than stubble. Thanks for the information Mr Woodward. The National Trust looks after about 50 hillforts and promontory forts in the south west. 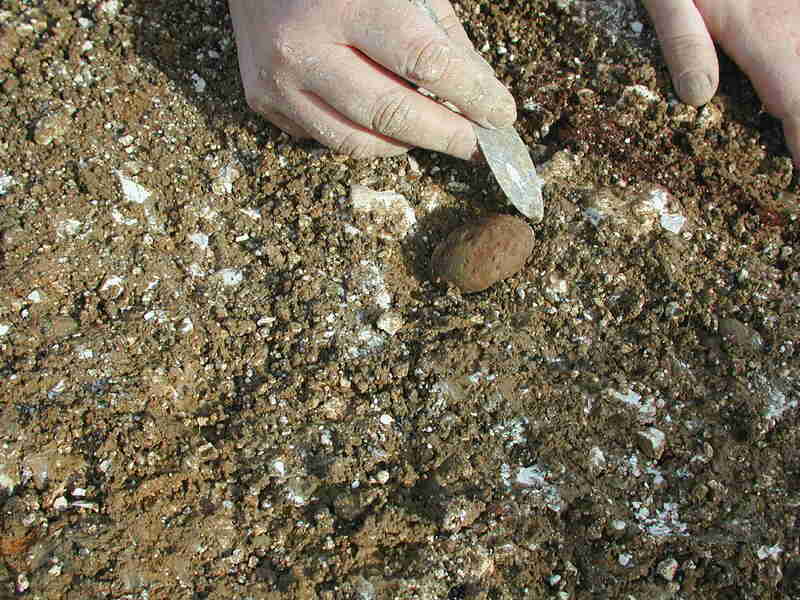 Archaeologists don’t agree about what they were used for (they don’t tend to agree). Status symbol for a local celeb? Sacred centre? Administrative hub? Market? Defended settlement? Wealth storage vault? Prison? All of the above? Over the 500 years or so hillforts were in vogue, I like to think that their role fluctuated over time. In Dorset, I’m pretty sure that the impressive fortresses within the county usually fulfilled their traditionally believed role, as a place people could live in securely, particularly in dangerous times. Digging deep ditches and building massive ramparts with primitive tools would take a long time and surely not something to be done unless there was a real need. Badbury Rings in Dorset is the highest hill in the area. There are good views out in all directions, surrounded by three concentric rings of banks and ditches. Apart from these massive earthworks what other evidence might be found to suggest it had a defensive function, a place that may have witnessed conflict. Finds of weapons and projectiles would help. 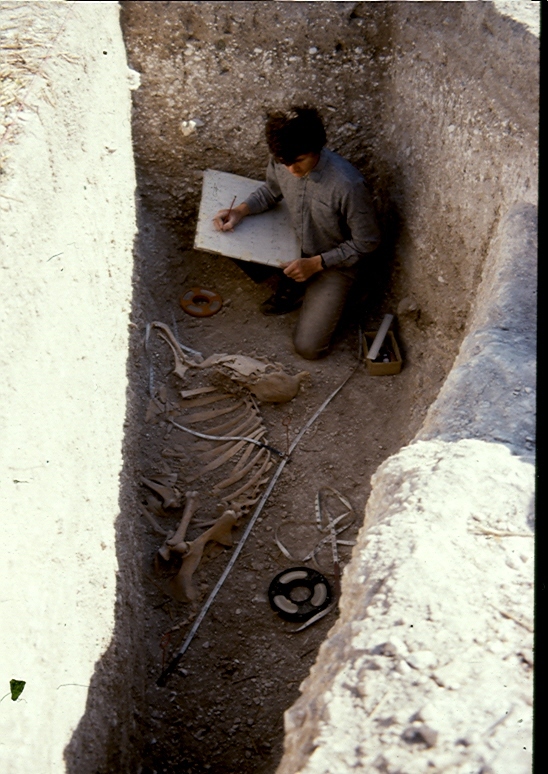 Over the years there have been stories of finds. About 200 years ago someone ploughed up a leaf-shaped bronze sword in a field on the west side of Badbury and one of the National Trust rangers found a bronze axe in a drainage trench in 1990. These are about 3000 years old and show that Badbury hill was important before the Iron Age. 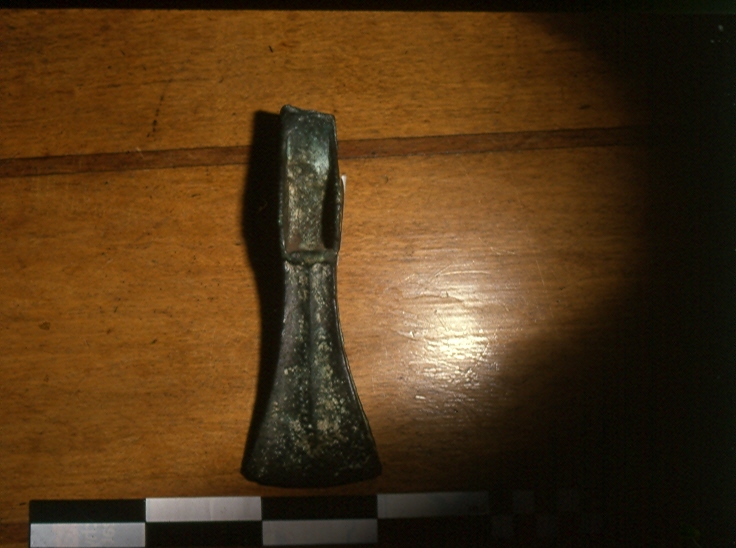 Late Bronze Age palstave axe which fell out of the side of a drainage ditch south-west of Badbury. I have often wondered what happened at Badbury during the Roman Conquest. Did the local people strengthen the hillfort against Roman attack. The native people of Dorset are thought to have been known as the Durotriges and they refused to surrender their land to the Romans without a fight. After defeating the more powerful tribes in the south-east, the future emperor Vespasian was sent with the Second Legion Augusta to mop up the west. 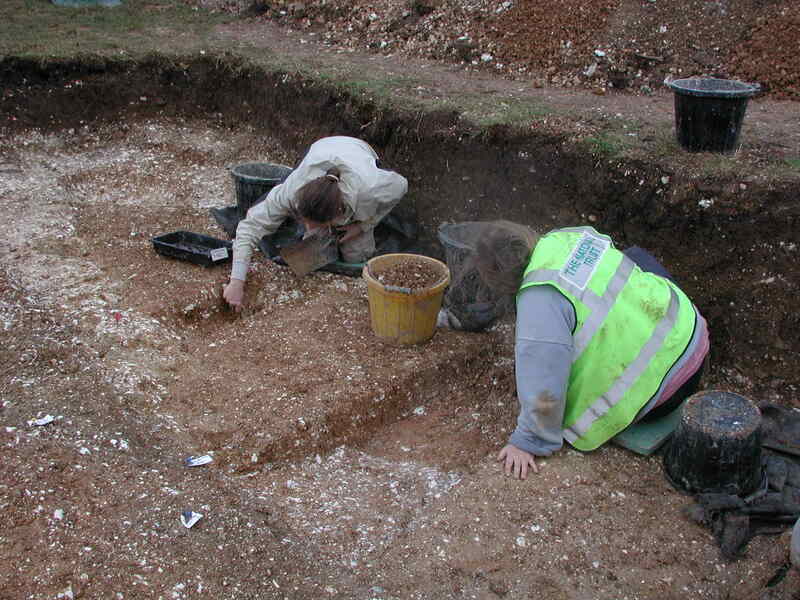 2005 Excavating a drip gulley dug around a round house built within Badbury Rings about 2000 years ago. His soldiers conquered the Isle of Wight, defeated two warlike tribes and captured 20 fortified settlements. The fleet entered Poole Harbour and a military supply depot was established at Hamworthy. 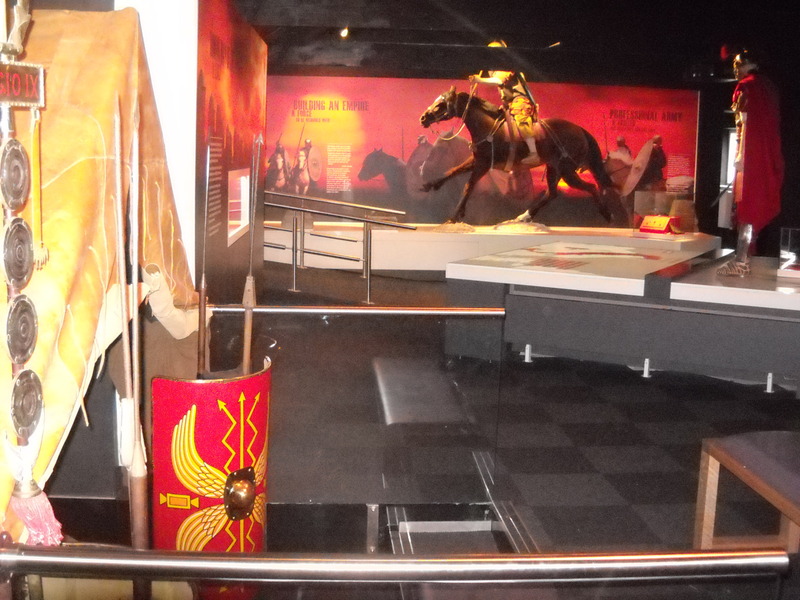 A road was built north up to the River Stour and a half legionary fortress was built. It was discovered in the 1960s and would have housed at least 2000 soldiers. It is just a few miles south of Badbury Rings close to the modern town of Wimborne Minster. The Durotrigan forces would try to hold the Romans at the river crossing or defend the first stronghold (Badbury) north of the river. Recently an archaeologist watched while ponds were dug on the National Trust land on the north side of the river beside the legionary fortress. Nothing was found.. Evidence of conflict seemed unlikely, perhaps the locals gave in without a fight. Faced with a disciplined fighting force it would make sense…. but back in 1952 a javalin head was found stuck into the chalk beside the Roman temple site at Badbury. Then in 1963 a spearhead from a Roman artillery ballista was found about 500m from the hillfort beside the Beech Avenue. These were just two random finds… until a couple of weeks ago when the metalwork report came back from our excavation in 2000 at the Badbury temple site. Jorn had found among the earlier finds, two iron projectile heads which were typical mid-1st century AD ballista bolts. Badbury has witnessed many events, these days it’s mostly sheep grazing and picnics but these finds seem to be scattered leftovers, stray finds, perhaps from a desperate struggle for Dorset independence lost almost 2000 years ago.